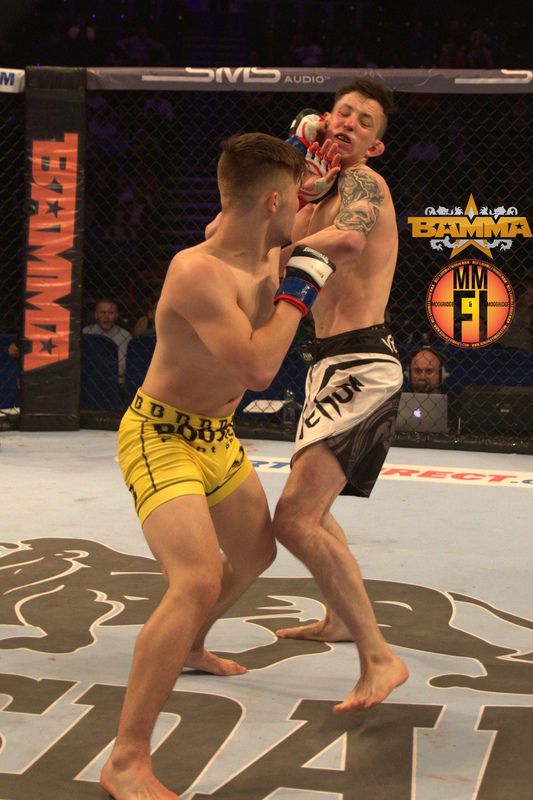 Regis ‘The First’ Sugden stole the show once again when he defeated Ant ‘The Submission Magician’ Phillips on Saturday 25 April, making it three victories in a row in the BAMMA cage for the 19 year-old from Newark. 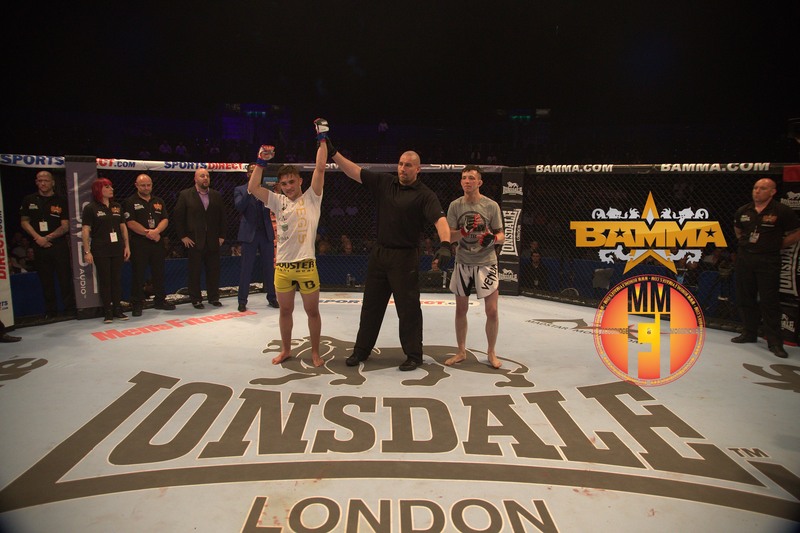 An explosive TKO win in round one at BAMMA 20 in Birmingham secured the Suggy’s Gym fighter’s unbeaten run since his professional MMA debut in December, with two wins by TKO and one by submission. Although he was up against a local fighter with 12 professional contests to his name, Regis came out to a loud and excited crowd. The game plan was to push and press, being very lively in the first round and dominating with superior striking. To the surprise of the Newark camp, Ant came to stand and trade with Regis, a decision which proved to be his downfall as Regis landed fast and powerful right hands and left hooks, causing immediate physical damage to his opponent. 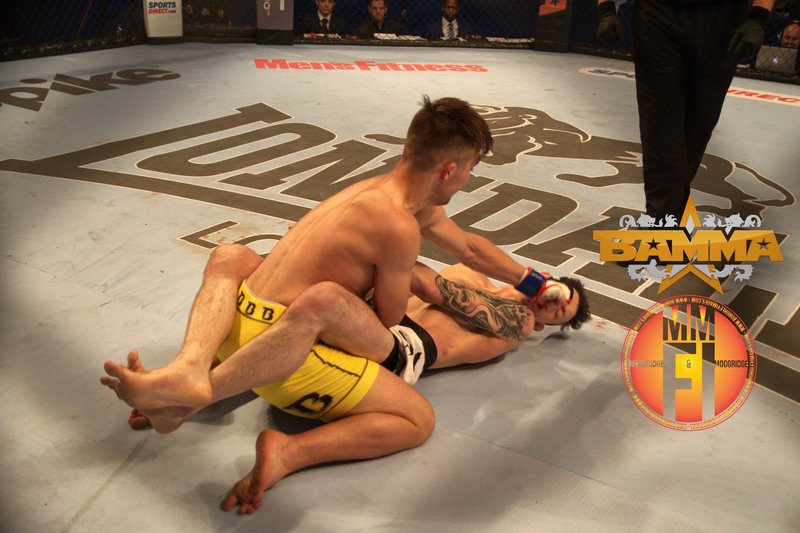 As Ant tried to come inside, Regis changed levels and took him to the ground to score the first takedown. Back to his feet instantly, Regis continued to put the pressure on and with some fast striking and great movement took Ant down for a second time, this time landing in Ant’s guard. The Newark fighter followed the instructions of his corner to the letter, dominating his opponent and landing some big punches to break Ant’s guard, before returning to his feet after delivering a hammer fist to the top of Ant’s head. Seeing his opponent struggling to cope with the pace, Regis feinted a jumping push kick after narrowly missing with his trademark spinning hook kick, then landed a perfectly timed double left hook which dropped Ant to the ground. As Regis proceeded to ground and pound, the referee stepped in to stop the bout with Ant in no position to continue. Celebrating his third win inside the distance under the BAMMA organisation, Regis said: “I’m delighted to be showcasing my skills with BAMMA. My double left hook is becoming a trademark – bantamweights in BAMMA need to learn how to deal with this. Head coach of Suggy’s Gym, Dean Sugden added: “The fight was picked to be shown on the live event televised on Channel 5 and Spike TV and the attention Regis has been getting after his win has been very interesting to say the least. There were a lot of big names and scouts at BAMMA 20 – let’s just say the phones have been red hot since Saturday night.